It was many years ago, we had a function at home in India. The food was a simple Konkani javan(meal). This was the time I had just started my blogging and very much into learning new recipes. The cook was making his signature Devasthana saru/rasam, which was usually served during functions at temple. It had a heady delicious aroma and was spicy, tasty. I requested him for the recipe and he was very generous to share it with me. I have prepared this so many times and every time it brings back memories of home. Recently, we had some friends home. My friend M, who is also a Konkani, asked me if I knew this Devasthana saru/rasam. I said it is on my blog and next day I had to prepare it myself. The only reason I don’t make this often is, my family forgets how much rice they have consumed with this rasam. I have to make sure to cook some extra. My 7 year old loved it and asked to give it in his lunchbox next day (which he almost never does!). So beware! don’t make it when you are on a diet :). 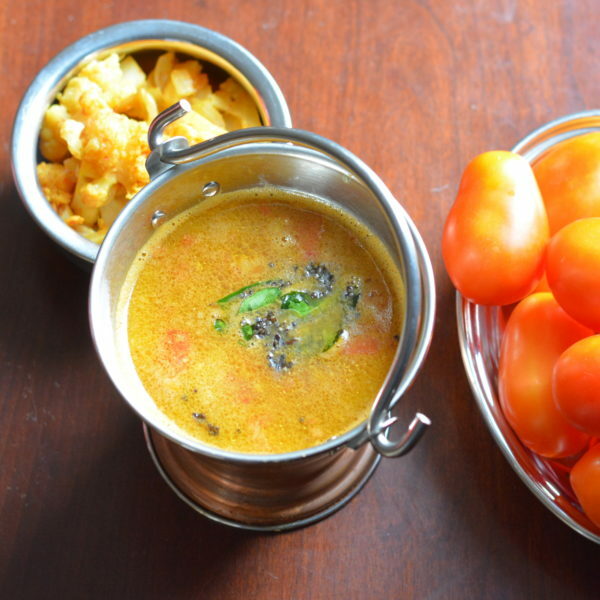 A sweetish spicy rasam/saru usually prepared in Konkani temples. 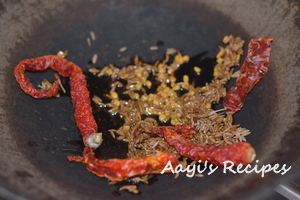 Heat oil and fry cumin seeds, cloves, methi seeds & red chillies. 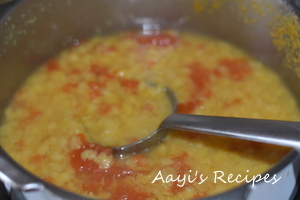 Cook toor dal with a pinch of turmeric in pressure cooker. Cook Tomato pieces in water(or add it to dal while cooking it). When cooked, add ground masala, dal, jaggery, salt and cook for some time. Add water to make it thin, of rasam consistency. For seasoning, heat oil and add mustard seeds and curry leaves. When mustard starts popping, add curry leaves and pour this over rasam. Shilpa: Shinu, itd dry red chilies. You can use any variety you have. I use Byadagi in all my cooking. 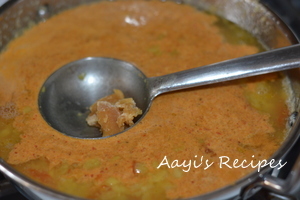 Hi Shilpa — your blog is looking great and this rasam looks great! And the methi paneer below… hope you’re well! So glad to see you here Linda. How have you been? In love with Rasams until eternity. One of the best drinks for health esp when sick. How do you cook 2 tsps. of toor daal in pressurecooker? How much water? Since it has tomatoes, another souring agent is not needed. But if you want it more sour, you can add tamarind. Loved this recipe. I always made the normal rasam but tried this twist for the first time with the coconut. It turned out to be yummy. Thanks for sharing.